Made specifically for professional tradesmen, Dalluge® hammers deliver dead-center accuracy and pure striking power. The full polished steel heads are precision cast, with a head-to-handle weight ratio is so precise, you’ll swear you’re swinging a much lighter hammer. 17" straight American hickory handles are ergonomically designed, improving balance while reducing shock transfer. The result is surer, deeper, more powerful nail driving, with less strain on the arm and shoulder. Faces are available with either textured or serrated surfaces (textured faces have a sand paper finish for gripping nails without tracking, while serrated faces provide a more aggressive grip pattern better suited for traditional framing). NaiLoc® magnetic nail holder is available on select models for one hand nail starting and increased reach. 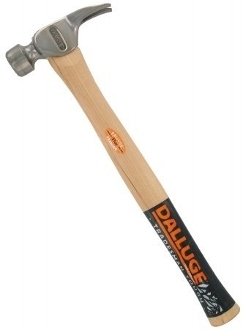 Designed by a professional carpenter for professional carpenters, Dalluge hammers are "tradesman tough."